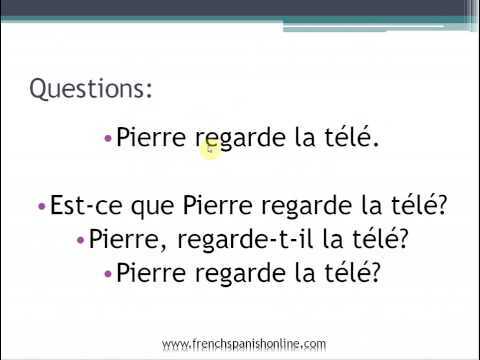 In French, to make formal questions, we usually invert the verb and its subject (je, tu, nous, vous, ils, elles). See Forming inverted questions in Le Présent (except il, elle, on forms). However, this method is not as straightforward when the subject is il, elle or on. Is he going to Paris? Y a-t-il un problème ? - Oui, il y a un problème. Is there a problem? - Yes, there is a problem. Notice that when the verb ends with a vowel (often the case with il/elle/on), then a t must be inserted in-between the verb and il/elle/on with hyphens : -t- . The purpose here is to make the sentence easier to pronounce. Is he doing well at school? Prend-on le train ou le bus? Do we take the train or the bus? When does he have his shower? Combien de bouteilles veut-il ? How many bottles does he want?